Here’s our course for the 4 day trip to the eastern Tuamotos, the atoll of Hao. The wind barbs are overlaid on the chart, showing the weather forecast for Tuesday. How do you read wind barbs? They show the direction that the wind is going, and also its strength, measured by the number of lines in its tail. Full lines are 10 knots, half lines are 5 knots. Therefore 2 full lines and 1 half line equals 25 knots. 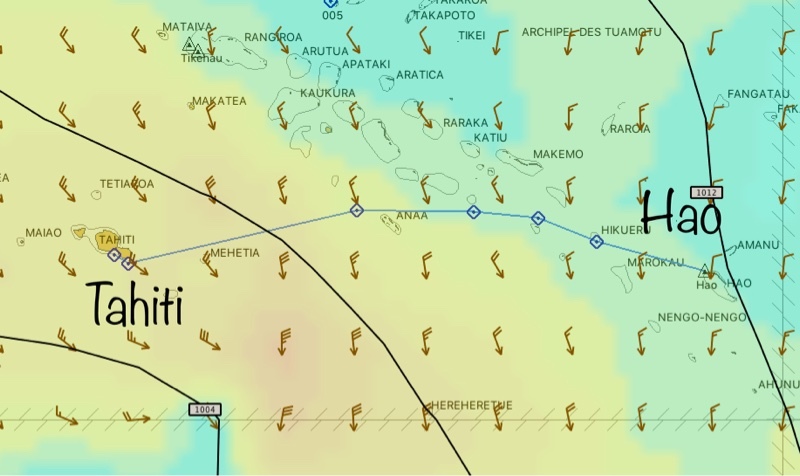 The forecast indicates 30 knot winds from NW near Tahiti, N winds of 15knots near Makemo, and light NNE winds of 10 knots near Hao. However these are considered “averages” so gusts 5-10 knots stronger than the forecast are very common, possibly more when there is unstable air associated with a low pressure system. We left on Saturday at dawn, to make as much progress to the east as possible, and get away from the roughest part of the storm, which was hitting Tahiti on Monday/Tuesday. Have a safe and sunny sail across to Hao.